The previous chapter was the Four Holy Truths Chapter. This is the ninth chapter. This is the ninth chapter, the Light Enlightenment chapter. “Light” refers to Prajna. “Enlightenment” comes when living beings see this brightness and enlighten to their minds. At that time refers to the time when the light Enlightenment chapter was spoken. From the wheels on the bottoms of the World Honored One’s –Shakyamuni Buddha’s – feet were released one billion bright lights. The bottoms of the Buddha’s feet emitted light. The feet are the lowest place on the body. Light was emitted from the wheels on the bottoms of the Buddha’s feet. This represents wisdom that is most balanced; not too high or too low. They also illumined a billion Jambudvipas—they illumined the southern continent of Jambudvipa, A billion Purva-Videhas—the continent to the east, A billion Apara-Godaniyas—the continent to the west, and a billion uttarakurus—the northern continent. They illumined a billion great oceans, A billion wheel-ringed mountains, and a billion Bodhisattvas being born. One billion Bodhisattvas descend from the palace of the Tushita Heaven to be born. A billion Bodhisattvas leaving home. One billion Bodhisattvas leave home to cultivate. Also, there are a billion Thus Come Ones accomplishing proper enlightenment, a billion Thus Come Ones turning the Dharma wheel, and a billion Thus Come Ones entering Nirvana. Also, a billion Sumeru, kings of mountains, a billion heavens of the four kings, a billion heavens of the Thirty-Three, and a billion Suyama heavens. This is telling how many there are. …A billion Tushita heavens, a billion Bliss from Transformation heavens, a billion heavens of Comfort Gained from Others’ Transformations, a billion heavens of the Brahma multitudes, a billion Light-Sound heavens, a billion heavens of Pervasive Purity, a billion Vast-Result heavens, and a billion Ultimate Form Heavens. All of these were clearly revealed in this light. Just as in this place one could see the Buddha, the World Honored One, seated on his lotus flower treasury lion’s throne, with Bodhisattvas as many as fine motes of dust in ten Buddhalands circumambulating him, so too, in each of the billion Jambudvipas, the billion Thus Come Ones were also seated in the same way. Because of the spiritual power of the Buddha, in each of the ten directions there was a great Bodhisattva, who together with the Bodhisattvas to the number of fine motes of dust in ten buddhalands, came to the Buddha’s place. Their names were Manjushri Bodhisattva, Enlightened Leader Bodhisattva, Wealthy Leader Bodhisattva, Jeweled Leader Bodhisattva, Merit and Virtue Leader Bodhisattva, Vision Leader Bodhisattva, Vigorous Leader Bodhisattva, Dharma Leader Bodhisattva, Wisdom Leader Bodhisattva, and Worthy Leader Bodhisattva. A billion Tushita heavens, a billion Bliss from Transformation heavens, a billion heavens of Comfort Gained from Others’ Transformations, a billion heavens of the Brahma multitudes, a billion Light-Sound heavens, a billion heavens of Pervasive Purity, a billion Vast-Result heavens, and a billion Ultimate Form heavens. All of these were clearly revealed in this light. In this state, all these heavens were revealed in the light. Just as in this place one could see the Buddha, the World Honored One, seated on his lotus flower treasury lion’s throne—in the Saha world, the people could see the Buddha seated on his adorned Lotus Flower Treasury Lion’s Throne, with Bodhisattvas as many as fine motes of dust in ten Buddhalands circumambulating him, the Buddha—soo too, in each of the billion Jambudvipas, the billion Thus Come Ones were also seated in the same way. Because of the spiritual power of the Buddha—They all relied on the Buddha’s awesome spiritual power. In each of the ten directions there was a great Bodhisattva. In every land in the ten directions there is a great Bodhisattva. Those who are lords in the Saha World are companions in the lands of the ten directions. Those who are companions to the Saha World are lords in the lands of the ten directions. Who together with the Bodhisattvas to the number of fine motes of dust in ten Buddhalands—in ten Buddhalands there are Bodhisattvas as many as fine motes of dust, who came to the Buddha’s place. They all arrived at Shakytamuni Buddha’s way place. Their names were Manjushri Bodhisattva, Enlightened Leader Bodhisattva, Wealthy Leader Bodhisattva, Jeweled Leader Bodhisattva, Merit and Virtue Leader Bodhisattva, Vision Leader Bodhisattva, Vigorous Leader Bodhisattva, Dharma Leader Bodhisattva, Wisdom Leader Bodhisattva, and Worthy Leader Bodhisattva. These Bodhisattvas all came from their own countries, that is to say, the Golden Colored World, the Wonderful Colored World, the Lotus Flower Colored World, the Champaka Flower Colored World, the Utpala Flower Colored World, the Golden Colored World, the Jeweled Colored World, the Vajra Colored World, the Crystal Colored World, and the Equally Colored World. In the presence of the Buddhas, all these Bodhisattvas cultivated Brahma conduct. These Bodhisattvas all came from their own countries. The great Bodhisattas have come from their own countries and arrived at the Way Place of the Buddha to listen to the Dharma. They made up the Buddha’s influential assembly. Each of them came from his own country, that is to say, the Golden Colored World—in the east the Wonderful Colored World—in the south, the Lotus Colored World—in the west –the Champaka Flower Colored World –in the north, the Utpala Flower Colored World –in the northeast, the Golden Colored World-–in the southeast, the Jeweled Colored World—in t he northwest, the Crystal Colored World—from below, and the Equally Colored World—from above. From all these worlds of the ten directions, the Bodhisattvas have come to the Avatamsaka Dharma Assembly in the Bodhimanda, to listen to the Buddha speak the Dharma. In the presence of the Buddhas, all these Bodhisattvas cultivated Brahma conduct. “Bodhisattva” here, refers to all the great Bodhisattvas whose names were just mentioned. They are those who from many kalpas past have been cultivating the Bodhisattva Way and benefitting living beings. They’ve been with Buddhas for a long time and they extensively made offerings, respected, and praised all the Thus Come Ones. They very carefully cultivated pure conduct. At all times they returned the light and reversed the illumination to look within themselves. They kept themselves from being lax. They never were casual or ignored the rules. “Brahma Conduct” refers to the cultivation of pure conduct. In cultivation of pure conduct one cuts off all defilements. When one purely cultivates Brahma Conduct one singlemindedly and sincerely cultivates. One doesn’t allow any confused thoughts to arise. Cultivating purity is like sweeping the floor. When the house gets dirty you clean it. Or else you use a vacuum cleaner to pick up the dirt. Cultivating purity is also cleaning up the dirt. It’s just getting rid of deviant knowledge and deviant views, taming your crazy and wild mind, and your thoughts that break the rules. Clean them up! You know how to keep your house clean, but in your mind you have dirty false thinking and scattered thoughts which you don’t clean up. If you don’t sweep clean, you’ll never be able to cultivate the Bodhisattva Way. At all times Bodhisattvas return the light and reverse the illumination. You should always bring forth the thought for enlightenment. If you do, then you’re purely cultivating Brahma conduct. 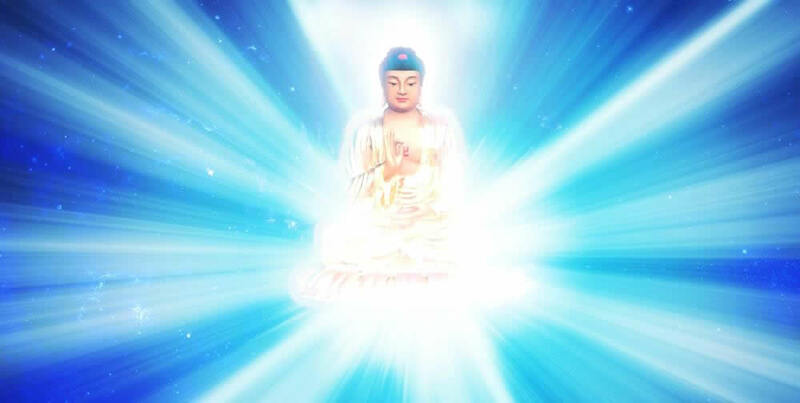 Specifically, Unmoving Wisdom Buddha, Unobstructed Wisdom Buddha, Liberation Wisdom Buddha, Awesome Deportment Wisdom Buddha, Understanding Marks Wisdom Buddha, Ultimate Wisdom Buddha, Superior Wisdom Buddha, Comfortable Wisdom Buddha, Brahma Wisdom Buddha, and Contemplating and Investigating Wisdom Buddha. The Bodhisattva draws near to Buddhas such as unmoving wisdom Buddha. This Buddha, in the Land of Still Eternal Light, is still and unmoving. But although he is still and unmoving, he pervades everywhere. He has proper and all-pervasive wisdom. And so his wisdom is extremely great. All of us are complete with the same unmoving wisdom as Unmoving Wisdom Buddha, but we have forgotten it. It’s as if we’re in a dream. All of our learning is useless. Unmoving Wisdom Buddha causes living beings to remember their own original still and eternal, unmoving wisdom. Unobstructed wisdom Buddha. This Buddha has wisdom without obstruction, so he’s called Unobstructed Wisdom Buddha. Unobstructed wisdom is within everyone. There isn’t anyone who doesn’t have it. It’s not just this Buddha who has that wisdom. Even living beings have this kind of wisdom, but they don’t know how to use it. Liberation wisdom Buddha. “Liberation” means not having any obstructions. One is truly free. All living beings also have this liberation wisdom. It’s only because we have attachments and false thinking that we can’t be liberated. We put liberation aside and don’t use it. Awesome Deportment wisdom Buddha. All Bodhisattvas draw near to Awesome Deportment Wisdom Buddha. This awesomeness puts people in awe. It is deportment that can be emulated. It is a method that can be studied. Walking, standing, sitting, and lying down are the four great awesome deportments. There’s not even a ripple on the water. A gentle breeze is very slow, and so when it goes over water it doesn’t even make a ripple. So it says to be like a gentle breeze. Don’t make waves. Don’t make any ripples on the water. Be like a gentle breeze, but not like a tornado so that when you walk you knock everything over. You should stand like a pine. Stand straight and strong like a pine tree. You should sit like a bell, don’t sit like the clapper inside the bell and swing back and forth. Instead, you should sit without moving. You want to sit and quiet your mind so that you don’t have false thinking. You don’t want your body moving all over the place. When you sit and stand, your body shouldn’t move. You should lie down like a bow. This is called the “auspicious lying position”. You lie on your right side and place your right hand under your head. Your left hand is placed on your left leg. When you lie in the “auspicious lying position” then everything is auspicious. Everything is good. But don’t move the mind of one who cultivates the Way. You can have the nerve to turn over the water in a thousand rivers, but you don’t want to causes the mind of one who cultivates the Way to move. The mind of one who cultivates the Way is like peaceful water that is without any waves. If you cause his mind to move, he might go insane. And if he goes insane it would be very easy for him to fall. In every single movement you should be in accord with the three thousand awesome deportments and the eighty thousand subtle practices. You shouldn’t obstruct anyone else’s cultivation. This is the Buddha, Awesome Deportment Wisdom. There is another Buddha called Understanding Marks Wisdom Buddha, and another Buddha called Ultimate Wisdom Buddha. This Buddha has ultimate wisdom—basic wisdom. There is another Buddha called Superior Wisdom Buddha. This Buddha’s wisdom is outstanding. Another Buddha is called Comfortable wisdom Buddha. He manifests his prajna wisdom with self-mastery. And there is Brahma Wisdom Buddha. This Buddha has pure wisdom. Contemplating and Investigating Wisdom Buddha had Wonderful Contemplating and Investigating Wisdom. At that time, in the presence of all those Buddhas, the voices of the Manjushri Bodhisattvas in all those places—In all those places” means that Manjushri Bodhisattva is able to pervade all places. He can go before the Buddhas in all the Way Places, so that in absolutely every Way Place Manjushri Bodhisattva is part of the influential assembly. But, you may ask, if his wisdom is already ultimate, why does he still go to the Way Places and become part of the influential assembly? It’s because he wants to cultivate his virtuous practices, to cultivate his blessings and wisdom. Although his wisdom and blessings are endless, he’s still not afraid of more. This is a very good question. The text speaks of Manjushri Bodhisattva being in every place. Even so, there is only one Manjushri Bodhisattva. Yet in every Dharma Assembly, Manjushri Bodhisattva manifests a body to act in the influential assembly. Since he manifests in that way, couldn’t you say there were that many Manjushri Bodhisattvas? Yes, you could say that. But you could also say that his original substance is just one, and that his transformation godies are limitless and boundless. It’s not necessary for him to move to create his transformation bodies. It’s just that right in the original place, he’s compleete with all his transformation bodies. His original substance and all his transformation bodies are two and yet not two. Although you see that there are so many, there is really only one. This can be likened to the moonlight, which can stand for the Dharma-body of the Buddha. Every place that has water has the moonlight reflected in it. When we see all these reflections, is it really the case that there are that many moons? No, there is just one. But that one moon can manifest in all different places, and in all places it’s still just one. Bodhisattvas are just like this. The many are just one and one is just the many. There is no difference between them. Another example would be a room full of mirrors. When you stand in the room, your body is reflected in all the mirrors. Your body gets divided yp and reflected in all the mirrors. Does that mean that your real body doesn’t exist? No. What appears in the mirrors is just a reflection, and the body you have doesn’t disappear. Yet for as many mirrors as there are, a corresponding number of bodies will manifest. This is another way to show how Manjushri Bodhisattva makes wonderful use of his spiritual penetrations to appear everywhere. In the presence of all those Buddhas, Wonderfully Auspicious Bodhisattvas appear. Their voices rang out in unison as they spoke verses: They all started talking at the same time. They all spoke the following gathas. This kind of state is extremely miraculous! That person still has not certified to the Way-eye. All the Manjushri Bodhisattvas, in all the Buddha’s Way Places, speak about the relationship between Bodhi and affliction. Bodhi is the path of enlightenment, and afflictions are living beings’ karmic obstructions. Where do afflictions come from? They come from emotional desire. If you have afflictions, then you will have karmic obstacles. So, Manjushri Bodhisattva wants to explain Bodhi and affliction to cause us living beings to understand how to cultivate Bodhi, the way of enlightenment, and how to leave afflictions. If someone sees the one of proper enlightenment. This means one who pereceives the Buddha, the One of Proper Enlightenment. Perhaps this person sees the Buddha as liberated and free from all outflows. If you like to drink wine, that’s a wine-outflow. If you smoke dope, then you have an outflow of smoking dope. People who are greedy for wealth have the outflow of wealth. And those who are greedy for beautiful form have the outflow of beautiful form. Outflows are insatiable. For example, eating is an outflow and wearing clothes is an outflow. When you like to sleep, that’s an outflow. Any state that you go along with and end up getting afflicted by is an outflow. If you have thoughts of desire, then you will have a lot of outflows. Outflows are just all our various bad habits and faults. This includes continually breaking the rules and doing things that are not in accord with the Dharma. That’s what is meant by outflows. I agree. There isn’t anyone who doesn’t need to eat, sleep, and wear clothes! Outflows means over indulgence in these things. For instance, if when you eat, if you just eat your fill then that’s okay. You shouldn’t pay any attention to whether the food is good or bad. The important thing is not to have a lot of false thinking about what you eat, and then you won’t have any outflows. If, on the other hand you eat something and then give rise to a lot of false thinking, then you will have an outflow. You think, “I wonder if what I ate today had any food value. I don’t know if I’ve had enough nourishment or not. Will the things that I’ve eaten help out my body or not?” On the one hand you eat, and on the other hand you have so much false thinking about it that even if you did eat something nourishing, you’d waste it all by false thinking. You may have put the food in your stomach but it all flows back out in your false thinking. If, when you eat, you stop when you’re full and you don’t have any false thinking about whether the food is good or bad, then you’re a person of the Way without any thoughts. “No thoughts” means that you eat and don’t have any false thinking. And if you do it in this way, then the nourishment will be endless and boundless. It’s just because of your false thinking that all the proteins and vitamins disappear. This can be likened to a bowl with water in it. If there aren’t any cracks in the bowl then when you put water in it, the water won’t run out. It doesn’t have any outflows. But if there are cracks, then the water is going to leak out. People’s false thoughts are just like cracks in a bowl. If you don’t have false thinking, then you don’t leave any cracks for outflows. Originally, you didn’t have any of these false thoughts. Why do you want to create some and start speculating about what the food tastes like and analyzing every bit of it for its vitamin content? No matter how much false thinking you have about what you ate today, by this time tomorrow when it has passed through your body, you certainly won’t want to eat it, no matter how good it was before. If you don’t have any false thinking then the nourishment will stay in your body and will not flow out. But the more false thinking you have about it, the more of its energy-value you lose in outflows. If you wear clothes in order to keep warm, that’s okay. But, if your objective in wearing clothes isn’t to keep warm, but rather to look good and to cause others to notice you, then that’s an outflow. As soon as someone pays attention to you, an outflow takes place. If you worry about whether your clothes are good or not, and keep wanting to change outfits, then there is an outflow. When you wear clothes you should only wear them to keep warm. Don’t have false thinking about them. What’s the outflow of sleeping like? When it’s time to go to sleep, you lie there but you can’t go to sleep. Once you start false thinking, sleep runs off and you don’t know where to find it. You toss and turn and still you can’t go to sleep. Would you call this an outflow or not? It’s the outflow of sleep. And if you don’t get enough sleep then the next day you won’t have enough energy, because you used it all up false thinking all night. Not getting enough sleep is an outflow and getting too much sleep is also an outflow. If you get just the right amount of sleep then there is no outflow. So, tell me now, which one isn’t an outflow? Eating? Sleeping? Wearing clothes? So what were you opposing? You basically don’t understand and because you’re so stupid you objected. That is really pitiful. are all outflows. But these outflows can be stopped. If you get to the place where you can flow and yet not flow, then you can be said to have no outflows. But having no outflows still does not mean you have really made it home, because if you have "outflows" then you still have something. Basically there are neither outflows nor non-outflows and that’s the ultimate state. Happiness: means you really like something that you shouldn’t like. For instance someone’s death makes you really happy. You say, “ha,ha, that guy died.” You shouldn’t be happy when somebody dies. Anger: You see people who are following the rules and you get really angry and say, “Hey you stupid ones, why do you want to follow the rules?’ You shouldn’t get angry but you get angry anyway. You think “Why do you people who study Buddhism have to be so reliable and moral? You’re really stupid.” Scolding them is an outflow. Grief: Somebody is getting married and everybody is happy except you who cries instead. You say, “Oh why do you want to get married?” Now you tell me, is that an outflow or not? People really won’t like it if you do things like that. It’s really unsuitable to cry in this kind of circumstance. There’s no reason for you to cry, but you cry anyway. That’s an outflow. Fear: Somebody encounters an unfortunate situation and they’re terrified. Instead of comforting them, you say some totally unnecessary thing that is out-of-place. That’s not right. Hate: Some people meet each other and before they’ve exchanged words they’ve already decided they hate each other. The first thing they say is “I hate you”. What’s the reason for this? There is none and they are wrong to feel this way. That is an outflow. Desire: If you conduct yourself in ways that are inappropriate and do things which aren’t in accord with the Dharma then this is an outflow. If you use these seven emotions incorrectly then they are outflows. But the state that exists before these seven emotions arise is called the Middle Way. If you can be happy when it’s time to be happy, then there’s no outflow. To refrain from anger when the situation incites anger is best. Anger is a big outflow. If you can refrain from anger then you’ll very quickly open enlightenment. Whoever has a big temper will be slow to awaken. Your continual anger will frighten enlightenment away. Enlightenment will say, “Oh, you’re so angry, I can’t stay around here!” The only enlightenment that you’ll open is anger-enlightenment and that is not right. These are all different types of outflows. Now to resume Manjushri’s verses. All conditioned dharmas are like dreams, illusions, bubbles, shadows. Sweep away all dharmas and leave all marks. In the Buddhas’ states there is no separating or no not separating. They have leapt over all feelings and left all views. They have transcended all common feelings and gotten rid of the views of common people. That’s why their state is called inconceivable. This vstate is the basic substance of all Buddhas. If you say that all Buddhas have already left all outflows, then you still don’t understand the Buddhadharma. If you say that the Buddhas have already relinquished attachment to worldly dharmas, you again don’t understand the Buddhadharma. If a Buddha isn’t attached to worldly dharmas, then why does he dome to this world to teach and transform living beings? And yet if you say that he is attached to worldly dharmas, then why isn’t he as upside down as common people? He isn’t attached and he isn’t not attached. He sweeps away all dharmas and leaves all marks. The path of words and language is cut off, and the process of the mind is stopped. He leaves all appearance and this is inconceivable. If you say that he has left something, then you have set up a distinction between that which is left and that which is not left. So, it’s not ultimate. If you say that there is an attachment and a non-attachment you are still talking about opposing dharmas. That’s why the last line of verse says, that person still has not certified to the way-eye. If you see it this way then you have not certified to the ultimate, which is the eye that sees the Way. If you haven’t certified to the Way-eye then you don’t have true and actual wisdom.